They call it “second album syndrome”. For every Radiohead’s The Bends there’s a Stone Roses’ Second Coming. Such is the case with this second compilation of 50 Atari releases from their 1970s/1980s heyday. The first Flashback Classics collection was a hard act to follow. Here’s the proof. Loaded up with another nine arcade conversions, there are a couple of gems. Asteroids remains as thrilling as it was back when brown was considered the height of fashionabilityness. Missile Command is a genuine classic. Crystal Castles is also a gem (pun not intended, but if the honeypot fits). Even brick-busting Super Breakout deserves a nod. But unplayable then and unplayable now stuff like Red Baron and Gravitar? Nuh-uh. Mind you, the lack of paddle/trackballs doesn’t help some of these games’ cases. Onto the Atari VCS/2600 stuff, the lack of anything vaguely licensed – heck, even pixelized turd ET would be welcome for history’s sake - really hits home. With a mere handful of exceptions – Haunted House, Outlaw, Secret Quest (if you’re feeling generous) - this collection boasts the real also-rans. While the programmers did what they could with the extremely limited hardware at their disposal, the likes of Night Driver, Basic Math and Sub Commander smelled of poo in their day, and still do. Sure, many of these hit some 40 years ago in the infancy of video games, so some slack must be given. But that first collection demonstrated that there were many utter delights which still stand the test of time, at least play-wise. Also, where are the likes of 720°. 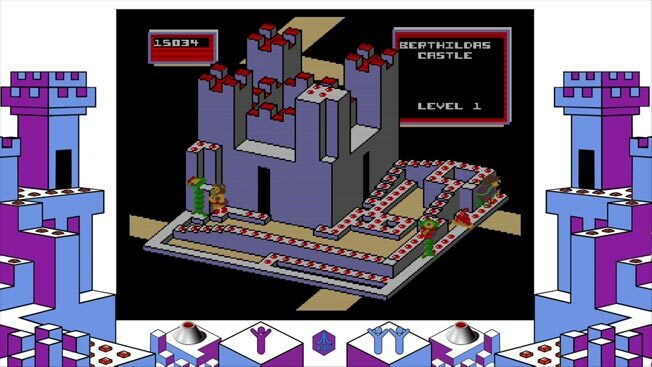 APB, Battlezone, Blasteroids, Escape from the Planet of the Robot Monsters, Gauntlet, Klax, Marble Madness, Paperboy, Rampart, Road Blasters, STUN Runner, Toobin’, Vindicators and Xybots? Now those titles alone would make a killer Vol 3. As a historical chronicle this collection is valid, but if you want a big swag bag that’s oozing at the seams with playability, go for that first disc. History is important. But, as this compilation reminds us, it isn’t always glorious.